2-Gang Prism Molds, 1x1x10in - Gilson Co.
2-Gang Prism Molds, 1x1x10in (25x25x254mm) cast Portland cement paste, mortar or concrete prism specimens for use in length change testing. 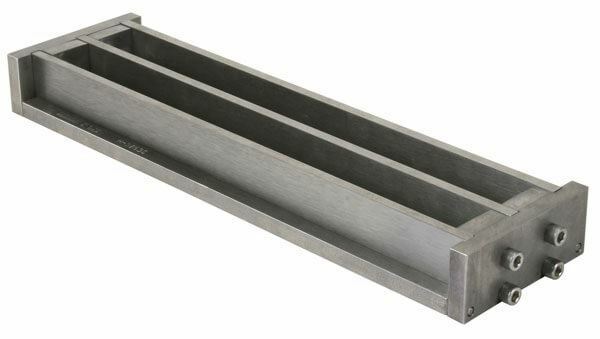 The mold comes with a base plate, removable partitions and end plates to provide required length between ends of HM-268 Gage Studs cast in ends of bars. Dimensions from outside end of gage studs are 11.625in (296mm) with specimen cross sections of 1x1in (25x25mm). HM-257 2-Gang Prism Mold is made of steel, while HM-258 2-Gang Mold is constructed of stainless steel.